TWO INTERNATIONAL FIRMS have revealed plans to invest more than €1.1 billion building around 3,000 apartments across the Greater Dublin Area. Texas-based real estate company Hines and APG Asset Management, which is headquartered in Amsterdam, announced the plans today as they officially launched the construction of 1,269 rental units at Cherrywood Town Centre in south Dublin. The apartments are the first phase of the Cherrywood Strategic Development Zone which is planned to eventually have a population of 25,000 people. The area already has a stop on the Luas Green line. Sisk has been awarded the contract to build the 1,269 units, including 130 social units, which are expected to be completed in 2020 and will see the creation of 300 construction jobs. The entire Cherrywood project is predicted to create 3,000 construction jobs over the course of its lifetime. “Hines has spent the last two years putting in place the essential infrastructure for the Town Centre and wider project and we hope this will be the first of many building projects to get under way in the next few years at Cherrywood,” Brian Moran, managing director of Hines’ Dublin office, said. 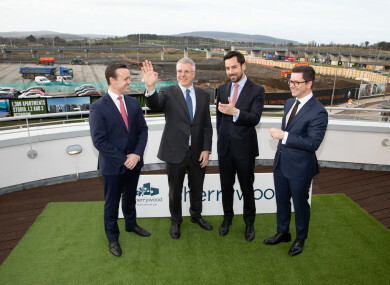 The launch was attended by Minister for Housing Eoghan Murphy who said that the strategic development zone status allowed the Cherrywood project to be delivered in an accelerated timeframe. “It is officially the largest urban development in the State and in time will see approximately 8,000 new homes becoming available in the area,” he said. Development in the SDZ is being supported and accelerated through measures under Rebuilding Ireland and I am delighted to see the tangible progress being made which will have a major impact on supply in the area. Plans for the Cherrywood Strategic Development Zone were first unveiled in 2010 however it has been hit by delays over the past eight years due to complications with multiple landowners. The plans include the development of over 7,700 new homes, six schools and three major parks. Email “International developers reveal plans to build 3,000 apartments for rent across Dublin”. Feedback on “International developers reveal plans to build 3,000 apartments for rent across Dublin”.